Set-up to cruise and remain off the dock for weeks at a time. Seriously for sale by owner. _________________________________________ Main salon The main salon has a sliding door to starboard for easy deck access. Couch to starboard, chairs to port. Lower steering station, machinery controls and electric panel forward. There is teak flooring with four engine room access hatches for major maintenance. The engine room has access aft under salon stairs. _________________________________________ Master Stateroom Aft and down from the main salon Queen bed on the centerline Ample drawers and cupboard-type storage Make-up area and two hanging lockers Wash/dryer with storage above. Aft engine room access under salon stairs _________________________________________ Master Head Master Head forward with shower stall Vacu-flush head Molded sink and counter top, with storage outboard. _________________________________________ Galley Forward and down from main salon the u-shaped Galley has teak and holly sole. There is great storage with six drawers and louvered panel doors above and below the counter Tundra, Seafrost refrigerator 12V Trash compacter 3 burner electric stove with oven Microwave oven Water system: pressure and dockside Deep double stainless steel sinks Plentiful Storage	_________________________________________ Dinette Across from the Galley is a teak table and seating for eight. The table lowers for an additional double berth. _________________________________________ Guest Stateroom Guest Stateroom has queen bed on the centerline Teak and holly flooring Hanging locker and ample storage Bowmar hatch with custom screen Reading lights	_________________________________________ Forward Head Access from galley and forward stateroom with shower Vacu-flush toilet and molded counter and sink	_____________________________________ _ Electronics Lowrance GPS plotter Interface Probe forward depth Datamarine multi depth/speed Standard Horizon depth Standard Horizon VHF Receiver W-H autopilot model HC-2-2 Infinity VHF transceiver JRC 48m radar Sea Sharp self-aligning satellite TV dish and receiver	_________________________________________ Cockpit Six foot cockpit with transom door to swim platform Hot and cold fresh water shower 4 rod holders Rod storage Lee outriggers Fish box. Cockpit freezer	_________________________________________ Swim Platform Huge swim platform with three large storage compartments and ladder making all boarding, diving, and beach to boat activities easy. _________________________________________ Tender Carib Rib .15 HP Yamaha outboard. Boom type, 800lb hydraulic hoist. Stored on Sundeck rooftop _________________________________________ Aft Sun Deck Four steps up to fly bridge, four steps down to the cockpit, entrance down to main salon. 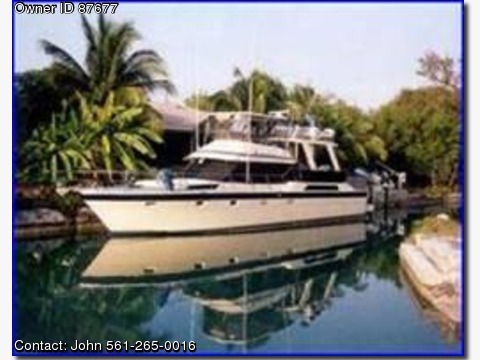 Fiberglass structural overhead Wing doors port and starboard Teak table and four teak chairs Wet bar with stainless steel sink Ice maker and storage	_________________________________________ Fly Bridge Two permanently mounted helm chairs Settees with cushions port and starboard Large storage area forward Large dock box for dock lines Aft and up to dinghy storage and hydraulic davit _________________________________________ Electrical 2X30A120VAC shore service w/cords Full 12VDC & 120VAC panels 2X8D main starting batteries 4X8D house batteries 1X4D generator starting battery Automatic engine battery charger 50A Northern Lights 15KW generator with sound shield 4500 hours Main engines have auxiliary 160A alternators which charges the house batteries Balmar DC power unit which powers a 300A alternator by direct drive from a Yanmar 2 cylinder diesel charging house batteries Vanner 3600W inverter and batteries are monitored and controlled by a Trace panel _________________________________________ Mechanical 3 Marine Air Reverse Cycle Heat/Air 2 Bilge blowers 2 Bilge pumps - automatic 1 Bilge pump - manual Mains & Gen; fresh water cooled raw water strainers Mains & Generator; Mains & Gen Fuel shut off valves and transfer pump Hydraulic wheel steering Trim Tabs Fresh Water, Vacu-flush, electric heads w/holding tank Hot water heated by electric, main engines and Yanmar Sea recovery 600 GPD water maker Spare props Ice maker Washer & dryer	_________________________________________ Safety And Fire Protection- Fire Extinguishers: and 4 manual fire extinguishers and Halo fire extinguishing system in engine room Smoke detectors Carbon monoxide detector Personal floatation devices: 1 Type IV ring device mounted on stern rail, 20 approved life jackets EPRIB ACR Cat II w/GPS interface Signal flares Searchlights Bell Air horn 12 v	_________________________________________ Equipment Extra Heavy Ground Tackle: 45 lb Delta with 200 feet 3/8 chain 55 Fortress with 50 feet 3/8 chain and 200 feet 1 inch nylon rode. 22 Danforth with 50 feet 3/8 chain and 200 ft 1 inch Nylon rode Maxwell vertical capstan w/ wildcat & gypsy with 2 controls.